Video Graduan Oxfords Menempelak Perdana Menteri, Mahathir Mohamad atas sikapnya suka bergaduh dengan negara lain. Di petik dari Facebook Nabeel Naqie. 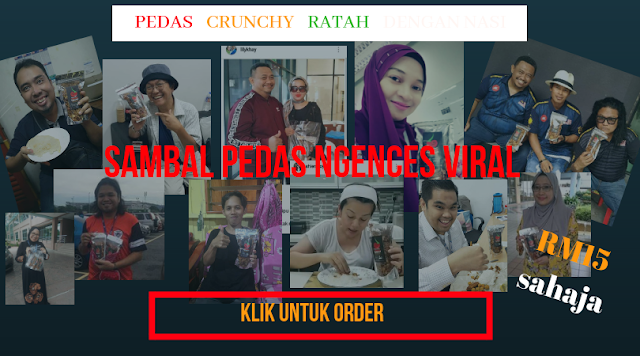 "Terhibur betul Nabeel tengok video ni. Abang kakak semua tengok la sesi soal jawab di Oxford University kelmarin. Tengok macam mana Tun M belit dan tak dapat jawab soalan seorang student Singapore. Student tu cerita tentang isu persempadanan maritim Malaysia - Singapore yang hangat sekarang ni. Dia quote nama DS Najib. Mahathir pantang dengar nama Najib, terus serang dia. Lebih kurang nak kata, ko bukan rakyat Malaysia jadi ko takde hak nak beri pandangan. Walhal soalan asal dia tak boleh jawab. Student tu profesional. Dia kata ini takde kaitan dengan Najib. Dia tanya soalan tentang sempadan maritim. Tetibe je Mahathir pi lompat ke isu jual air 3 sen.
Mahathir elak jawab soalan asal. Mahathir allergik dengar nama Najib. Mahathir divert isu yang takde kena mengena. Dengan student universiti pun nak membelit. 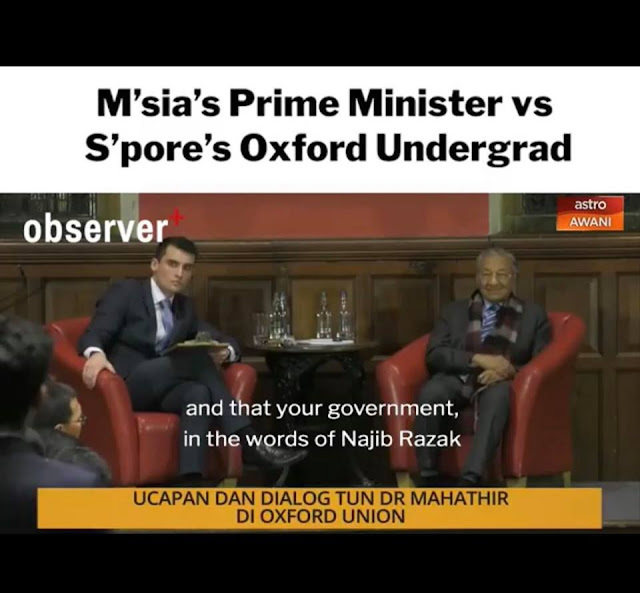 "Had a great exchange with Malaysian PM Tun Dr Mahathir at the Oxford Union, where I asked him about the ongoing maritime dispute between Singapore and Malaysia. Dr M responded that the 1962 Water Agreement is unfair to Malaysia. During our exchange, I understood his argument to mean that it was unfair for Malaysia to sell untreated water to Singapore at 3 sen per 1,000 gallons but buy treated water from Singapore at $60 per 1,000 gallons. Thinking that $60 per 1,000 gallons seemed strangely high, I subsequently double-checked this. It turns out that that Dr M was referring to the price at which Singapore's PUB sells water domestically (approximately RM 60 per 1,000 gallons). Singapore sells treated water to Johor at 50 sen per 1,000 gallons. Dr Mahathir thinks this is unfair but I disagree. Given that it costs Singapore RM 2.40 to treat 1,000 gallons of water, Singapore subsidises the water by RM 1.90 per 1,000 gallons. Johor sells this treated water to Malaysians at RM 3.95 per 1,000 gallons – meaning Johor earns a profit of RM 3.45 per 1,000 gallons. Dr M also noted that Singapore has bought water from Malaysia at a fixed price of 3 sen per 1,000 gallons since 1926, and that Singapore has stopped Malaysia from revising the price. This is also inaccurate. Singapore has purchased water at this price since 1962. Under the 1962 Water Agreement, Malaysia had the right to review the price in 1987 (when Dr M was PM). Malaysia chose not to do so. Furthermore, as Singapore's Foreign Minister noted in Parliament earlier this week, Singapore is obliged to sell Malaysia 5 million gallons per day (gpd) of treated water but out of goodwill supplies 16 million gpd. Two weeks ago, at Johor’s request, Singapore further increased the supply of subsidised water to 22 million gpd. In 2018, also at Johor’s request, Singapore supplied more than the usual 16 million gpd for 20 days. All the additional treated water has been supplied to Johor at the subsidised rate of 50 sen per 1,000 gallons, as per the 1962 Water Agreement. I hope that the Mahathir government reciprocates this spirit of goodwill demonstrated by Singapore and approaches negotiations over the airspace and maritime disputes with a constructive attitude. Finally, during our exchange, Dr M repeatedly referred to the disputed waters off Tuas as “international waters”. This contradicts previous statements from both Dr M  as well as the Malaysian Transport Minister , who stated that the disputed waters within the new Johor port limits are Malaysia’s territorial waters. Dr M’s concession that these are in fact international waters significantly undermines Malaysia’s initial claim. Mahathir ini sikapnya suka sangat cari pasal dengan orang lain. Sejak dulu lagi tak pernah berubah. Berbanding dengan Perdana Menteri ke enam, Najib Razak yang lebih gemar berdiplomasi dan perundingan, Mahathir di lihat sebagai seorang yang kepala batu dan ego.